WHISTLER, BC– June 19, 2014 – On Saturday, June 21 the Wizard Express Chairlift will start to shuttle skiers and snowboarders up to Blackcomb Mountain's Horstman Glacier for one of the most unique experiences Whistler has to offer; summer skiing and snowboarding. Less than a month after the end of the winter season, Whistler welcomes skiers and snowboarders from all over the world who are chomping at the bit to get back on the snow. 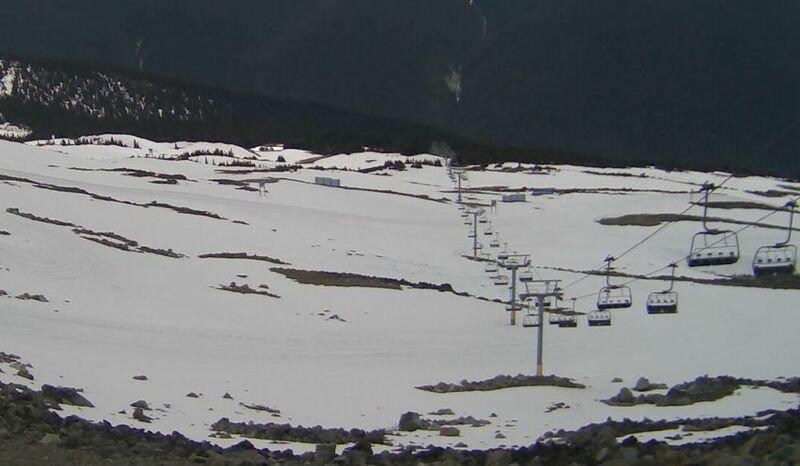 Completely out of sight from the valley floor, the action on Blackcomb Mountain from mid-June to the end of July draws today's best winter athletes as well as skiers and riders simply looking to get their snow fix. Supported by two T-bars, the glacier plays host to a public terrain park as well as private areas reserved by a long list of summer camps including Momentum Ski Camps and Camp of Champions, who both build their own massive parks. "The Grooming and Glacier Operational teams have been busy transforming Blackcomb's Horstman Glacier into the ultimate summer playground where the best in the world come to train, coach, and play in the summer." says Adam Francis, Whistler Blackcomb's Summer Glacier Operations Supervisor. "Our crews have been expertly pushing and sculpting the various terrain features, and installing the latest in rail, tube, bonk, and box features." Glacier operating hours are 12pm-3pm daily with the first upload at 11am. The journey to the glacier takes two chairlifts, the Wizard Express and Solar Coaster, and a bus ride across to ride up the 7th Heaven chair. The views on the way up are spectacular, with black bears and other wildlife often spotted from above. The Horstman Hut will be open to the public for snacks, and an outdoor barbeque with a stunning 360 degree view of the surrounding mountains and glacier action. Glacier skiing and riding will run until Sunday, July 27. Glacier skiing and riding seasons passes can be purchased at a special Early Bird rate of $415 until June 20, with regular price passes available for $485. Winter seasons passholders are eligible to purchase a pass for $290, with winter EDGE Cardholders eligible to purchase a pass for $335. Single day glacier skiing and riding tickets are available for adults $64, youth/seniors $56, and children $32. Tickets and passes can be purchased online or by calling 1.800.766.0449. For more information on summer activities at Whistler Blackcomb, visit www.whistlerblackcomb.com. Proud to be a venue for the 2010 Olympic and Paralympic Winter Games.